I can’t draw. But sometimes I need pictures to show ideas to clients, collaborators, and investors. Also, simply to help me visualize what the finished film will look like. So what I do is make really bad stick-figure drawings, then give them to my friend Brian (www.bicknelldesigns.com), and he turns them into proper storyboards. Magic. For the most part, I love storyboards. It’s a way of seeing a project come to life, and that’s very exciting. Especially when it takes years for a film to get financed and produced. You want to stuff your face with popcorn and see your damn movie already! But for a very long time, storyboards will be the closest you’ll get to that. For my feature film The Forgotten Kingdom, I made over three hundred storyboards, which not a single person saw because I left them on the roof of my truck on the first day of filming. This was in the windswept mountains of Lesotho, southern Africa. Those boards were gone forever. But I discovered that simply through the process of drawing them, the images had become ingrained in my head. Throughout forty-five days of production, a shot list was more than enough. Clients love storyboards. Cinematographers range from relying on them, to tolerating them, to wanting to wrap their fish and chips in them. Hitchcock wouldn’t step foot on set without them. Herzog says they are for cowards. It’s not hard to see both sides of this. On one hand they allow you to “rehearse” unique angles, shot compositions, and transitions – often vital when the sequence has any kind of action. On the other hand, the over-preparedness factor of storyboards can easily drag down the creative aliveness of your shoot. Nothing on set ever looks exactly like you draw it, and there’s a certain amount of spontaneity that can be missed if your eyes are stuck on your boards. In my opinion, it’s all about a balance. 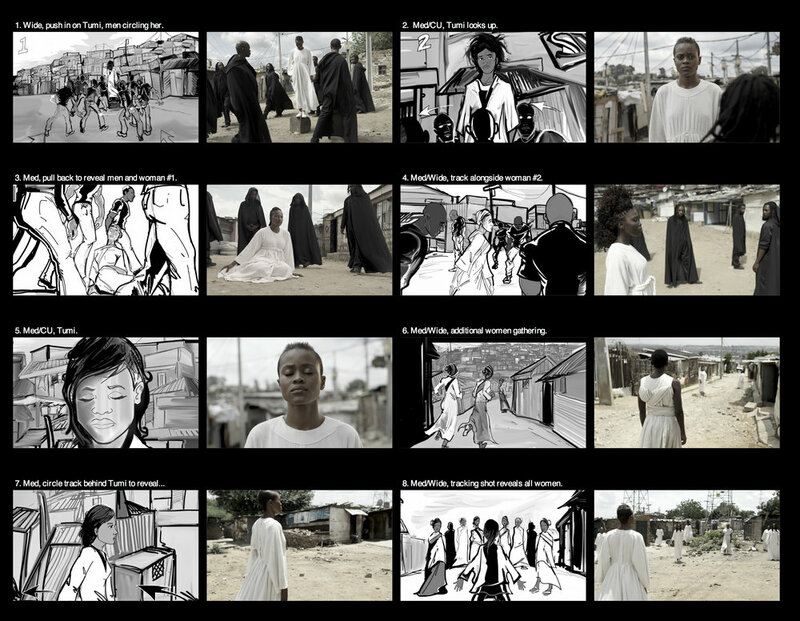 The storyboards below were for an experimental music video, The Alexandra Project, that I directed in South Africa. We made a total of thirty-eight storyboards, but only nine are shown here. Compare them to the corresponding image from the finished film, and you’ll see how the many forces that made up the shoot (location, blocking of actors, even the position of the sun) were all factors in determining the final composition of the shot.